The heart of the trail system at Forbush Corner lies on the east side of Roberts Road and is occasionally referred to as the East Trail System. Roberts Road is a dirt road that is not plowed during the winter allowing a two-way trail to link the East Trail System with the West Trail System. A two-way trail departs from a Start sign near the warming shelter and immediately comes to a well-posted junction that provides access to Lil Coaster and Rollercoaster. Further along the trail, it climbs to a prominent oak tree where there is a junction with Badlands Trail and Rollercoaster followed by two more junctions that provide access to Flatlands Trail and Rollercoaster a third time. The two-way trail then swings west and crosses Roberts Road for the West Trail System. The Most Difficult runs of the East Trail System is Rollercoaster, a 7-km ski from the Start sign, and the 8-km Badlands Trail. Lil Coaster is a 2.4-km loop rated More Difficult and the 1.5-km Flatlands and Pancake Trail, a 1.3-km loop, are rated Easy. The East Trail System is designed so skiers can easily jump from one trail to the next, choosing to bypass more difficult sections or add additional mileage. 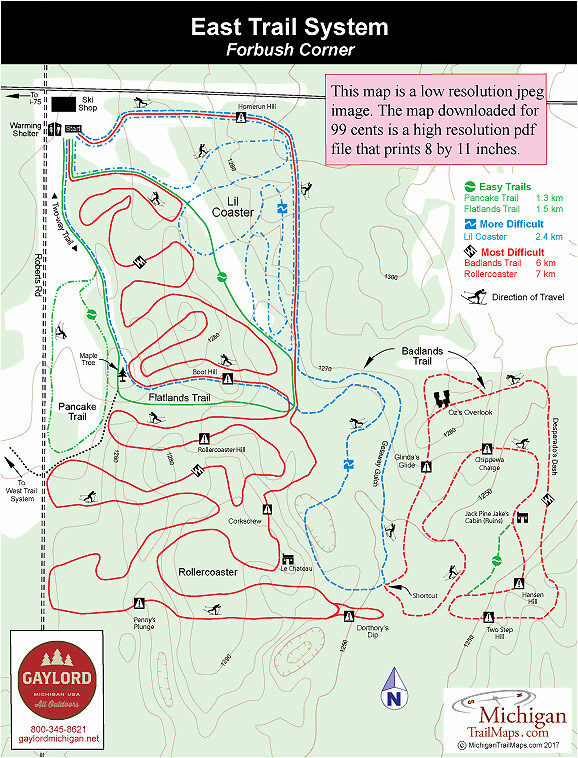 Though a trail map is handy, the system is extremely well posted with direction of travel, trail names, options and the names of hills. This is Forbush Corner’s best known ski trail, a 7-km that is rated Most Difficult. The trail is picked up near the beginning of Lil Coaster where it splits to the west (right) and immediately makes a short but steep climb. It’s a good warm-up for what follows. Within the first 2 kilometers you have opportunities at posted junctions to pick up Badlands Trail, Flatlands Trail and the two-way trail to the West Trail system. Rollercoaster then heads to the north end of its loop, where you encounter the best hills, including a short extension called Dorthory’s Dip and Corkscrew. 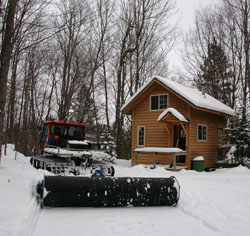 Reached after skiing past the Le Chateau trailside cabin, Corkscrew is one of the most exciting hills at Forbush Corner, a winding downhill run that is followed by a short climb. Just beyond Corkscrew is a major junction where you can continue onto the Badlands Trail or call it quits to climbing hills by heading back to the warming shelter on Flatlands Trail. You can also finish off Rollercoaster which at this point parallels Lil Coaster to Homerun Hill, a long downhill run to the starting gate. Badlands Trail is the newest addition to Forbush Corner, built in 2010. The 6-km loop includes a front section rated More Difficult and a back loop rated Most Difficult and is followed in a counter clockwise direction. This theme trail (think cowboys and the Wild West) is a delightful ski and not as difficult as Rollercoaster. Badlands is picked up at the major junction near the oak tree and begins by paralleling a section of Rollercoaster over Boot Hill. The two trails then reached a major junction where Rollercoaster swings west and Badlands heads east, still rated as More Difficult. In less than a kilometer you reach the junction between the two loops of Badlands and have the opportunity, via a shortcut, to skip the Most Difficult back loop. The back loop is a hilly but the runouts at the bottom of the hills are straight making it easier ski then other Most Difficult trails at Forbush Corner. The loop is also interesting as you ski past the ruins of Jack Pine Jack’s cabin, an 1875 homestead, and a long downhill run known as Desperado’s Dash. The highlight for many is climbing to Oz’s Overlook where there is a picnic table and a view. From the overlook you head downhill on Glinda’s Glide and return to the shortcut. The return to the More Difficult loop includes delightful Getaway Gulch, a tight wooded ravine where snowy slopes and trees rise on both sides of you. Badlands ends with sharing the same track with Rollercoaster and Lil Coaster. Lil Coaster is a 2.4-km loop rated More Difficult and followed in a counter clockwise direction. It begins with Rollercoaster but quickly peels away to climb a 1,300-foot hill and then descend it. At this point Lil Coaster crosses Flatlands Trail and merges briefly with Rollercoaster, providing you with the opportunity to continue on with the Most Difficult trail if you so choose. The second half of Lil Coaster is where Rollercoaster and Badlands merge into it and head back to the warming shelter via Homerun Hill, a long and fun downhill run. These Easy trails begin at the starting gate and provide non-threatening runs with little to no elevation gain. The 1.5-km Flatlands is often used to access or return from other loops of the East Trail System. Pancake is a 1.3-km loop picked up from the two-way trail before climbing to the oak tree. This flat trail is bordered by pines but loops through a snowy meadow. 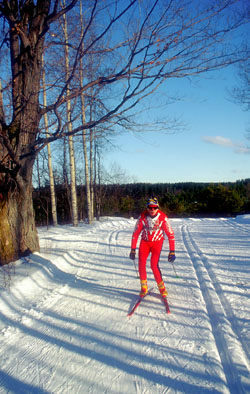 Many skiers use it as a warm-up before tackling more difficult loops.